Product prices and availability are accurate as of 2019-04-17 02:15:32 UTC and are subject to change. Any price and availability information displayed on http://www.amazon.com/ at the time of purchase will apply to the purchase of this product. 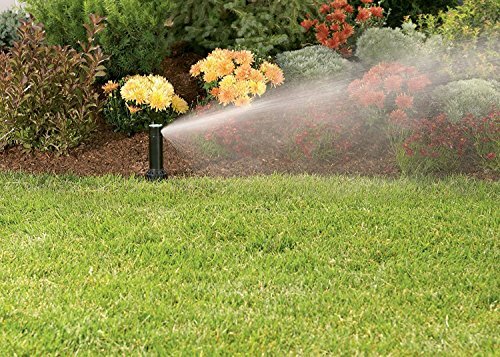 The Voyager II Pop-up Gear Drive Sprinkler Head offers a versatile spray distance from 25 feet to 52 feet, and can be adjusted in a part- to full-circle spray pattern. The gear-drive rotor provides even and complete water coverage, as well as a quiet spray that won't wake the neighbors. An easy-to-remove filter prevents clogging from dirty, non-potable water sources, and is easy to clean. The Voyager II is the perfect update for old, failing, or inefficient sprinkler systems and is a compatible replacement for all major brands of gear drive rotors. Comes pre-installed with a 3 gallon per minute nozzle, and a bonus rack of nozzles to adjust each sprinkler to achieve equal yard coverage. LONGEST SPRAY DISTANCE: Sprays adjust from a 25- to 52-foot radius, the longest distance in its class. COMPATIBLE DESIGN: Perfect replacement for old, failing, or inefficient sprinkler systems and is compatible with all major brands of gear-drive rotor sprinklers. AREA COVERAGE: Ideal for medium to large lawns. BONUS NOZZLES INCLUDED: Customize each sprinkler for equal yard saturation. Pre-installed with a 3 gallon per minute nozzle, which can be switched as needed. ADJUSTABLE COVERAGE: Comes with a key to easily adjust spray coverage from a partial section to full 360° watering.